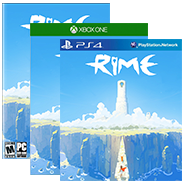 RIME XBOX ONE X Update is out! Sept. 26, 2018, 8:53 p.m.
Feb. 19, 2018, 6:16 p.m. The Boy? What about "The Child"? June 14, 2017, 4:02 p.m.